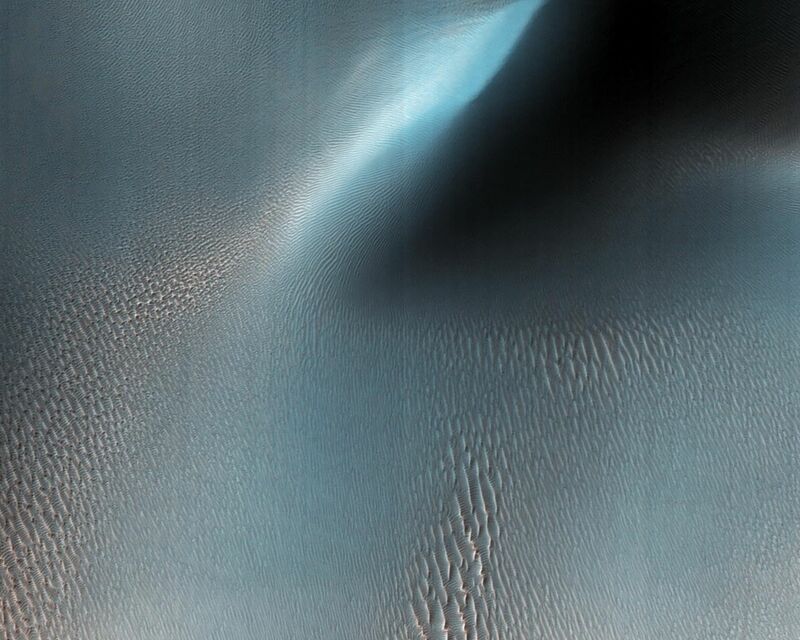 NASA's Mars Reconnaissance Rover (MRO) has observed two types of wind (aeolian) features in Proctor Crater: large, dark features that are sand dunes, made up of basaltic particles, and smaller, light-toned ripples that we call "TAR," or "transverse aeolian ridges." The origin of the TARs is a mystery. They might be dust deposits, or perhaps coarse grained ripples that are coated in bright dust. These TARs are less than 10 meters tall, and are much smaller than the sand dunes that reach impressive heights of over 130 meters. In other places on Mars, TARs are generally older than sand dunes, but here in Proctor Crater, it is not so obvious. How can we tell which came first, the TARs or the dunes? The dunes are situated on top of the TARs, and with this information, we can say the dunes are clearly the younger formations here in Proctor Crater. Fortunately, HiRISE has a tool that can solve this riddle. By taking stereo images of the same region from two different locations, we can estimate the topography of the region by measuring the displacement of surface features from one picture to the other. The result is a quantitative estimate of the local surface topography, called a digital terrain model. The dunes are situated on top of the TARs, and with this information, we can say the dunes are clearly the younger formations here in Proctor Crater. The map is projected here at a scale of 50 centimeters (19.7 inches) per pixel. [The original image scale is 50.6 centimeters (21 inches) per pixel (with 2 x 2 binning); objects on the order of 152 centimeters (59.8 inches) across are resolved.] North is up.